With most whodunits, the answer to that simple question usually becomes the most crucial point in the plot. In Broadchurch, the whodunit element is almost like the “MacGuffins” Hitchcock used in his movies: It’s what draws the viewer in initially (the stolen money in Psycho), but once we’re in, we’re exposed to so much more than that (Norman Bates and his mother issues). 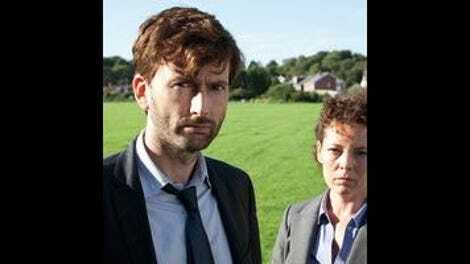 As we tune in to find out who killed 11-year-old Danny Latimer, we become invested in the town’s primary characters (mainly due to some ridiculously high-level performances), and this emotional resonance sets Broadchurch apart from similarly themed mysteries. Only a few weeks in, we almost care as much about the Latimers’ marriage or the D.I.’s enigmatic past as we do about the tragic event that drew them all together. In this third of eight episodes, the suspect spotlight focuses on Mark Latimer, Danny’s father. He looked pretty shady at the end of last week, with a tissue-thin alibi and plaintive pleas from the deceased boy to his father via social media. Andrew Buchan did a great job presenting a menacing front in that episode’s final moments, but those of us who have ever seen a murder-mystery before (to read: all of us) could figure out the case would not be wrapped up this early. Props to whoever suspected that Mark was really hiding an affair, and of Broadchurch’s cast of characters, there was only one actual possibility: Becca, who runs the local hotel. All the more reason to feel for Mark’s wife Beth. During a horrendous day in which her husband is under questioning due to his idiotic alibi, she again tries to escape her makeshift house arrest. She walks toward town, spying an oddly positioned yellow kite in the sky, which presumably symbolizes Danny (where is the kite flyer?). It’s easy see why people never leave Broadchurch: It is a beautiful, windswept, idyllic landscape that seems like the edge of the world. But Beth is headed not away from civilization, but toward it, and while she once found a comforting security in her town, it now hosts a series of anguished interactions for her. She works for the Broadchurch Tourist Bureau, in the same office space as the newspaper, and when she feebly tries to reassume her position at her desk, she is reproached by Maggie the newspaper editor, who tells her, “You’ve had a terrible thing happen” (that Beth doesn’t bitchslap Maggie for the obtuse obviousness of that comment, I credit to the austerity of the British) and shooed out. (Similarly, Danny’s friend Tom can no longer just play peacefully in the skate park, but is besieged by questioners.) Beth tries to pensively survey the ocean from a bench overlooking the town, but is trailed by the self-professed psychic from last week who wants to relay a message from Danny. Later she is so desperate for some comfort she hosts both the local pastor and the ominous psychic hoping for some kind of sign that her boy is okay, wherever he is. 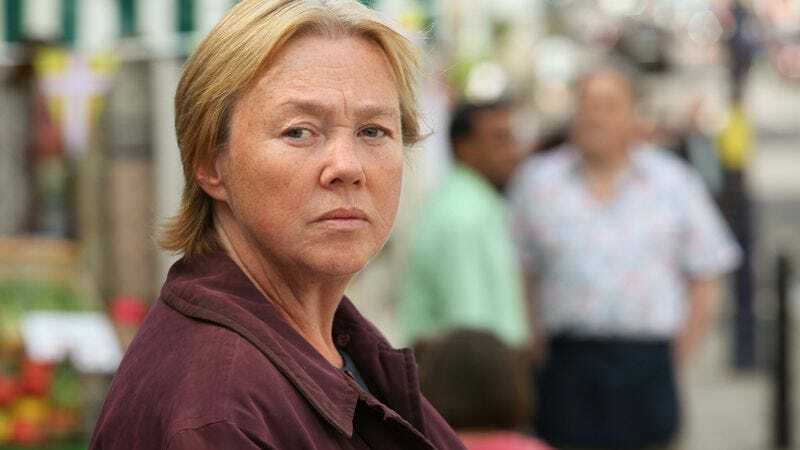 Home is no respite either, as she finds out there that Mark’s been arrested for refusing to account for his whereabouts on the night Danny was killed. She pulls her teenage daughter Chloe aside to caution that it’s just the two of them, they can’t trust anyone, not even Mark: “You never really know anyone!” Could she really not know the man she’s been with for 15 years? If Danny’s killer is still in Broadchurch, there’s at least one person out there with a hidden monstrous side. The caution that we may never really know anyone is chilling but also achingly possible. But Beth can’t even trust the one person she feels she has left, because Chloe knew about Mark and Becca’s affair and didn’t tell her. Chloe texts Becca to give Mark an alibi because she guesses they were together that night, and Mark is subsequently released. A later conversation between Detective Sergeant Ellie Miller and her equally good-natured husband seems to refute the claim that no one can ever really know anyone: When she calls home late from the police station, Miller complains about her new boss, and her husband encourages her to “smother him with kindness, El, isn’t that your usual way?” She clutches the phone tighter as he tells her to wake him up when she gets home. This moment of domestic intimacy is a far cry from the Latimers now that Beth is suspicious of her husband. She follows him to the docks, where she spies him with Becca, and her last few bricks of stability crumble underneath her; she has to lean against the wall for support. Jodie Whittaker is such a captivating actress that I can’t wait to see the ramifications in episode four. This episode also explores the dynamic of our favorite Broadchurch detective team, who are not so much good cop/bad cop as friendly cop/surly cop. As they head back to the mean lady with the keys to the hut, D.S. Martin cheerfully greets her neighbors in the rain as Detective Inspector Alec Hardy sulks along beside her. “You overcompensate,” he complains. “I know,” she admits. The gradual melting of their icy working relationship is subtle, yet one of the most engaging parts of the series. I practically wanted to cheer this week when Alec finally made Ellie a cup of tea. This episode also reveals a possible reason for his less-than-stellar personality: Not only did he previously lose a presumably similar case called Sunbrooke, he’s ill. He meets a doctor friend at the beach who warns him that if he doesn’t stay away from stress like this case, he’ll die. But Hardy claims he has to stay in Broadchurch and solve this case, for “penance,” he admits almost tearfully. Which ups his sympathy quotient with the viewer, although not with Ellie, who remains unaware. Their dysfunctional working relationship efforts culminate in Ellie taking her husband’s advice and offering a hilarious and furious dinner invitation to her partner. Alec is completely flummoxed, and even she doesn’t seem to be too excited about the prospect, but she points out, “It’s what we do.” He has no choice but to say yes. In a small-town community like Broadchurch, people have their bosses over for dinner, even if they don’t like them. They keep an affair under wraps at all costs because everyone in town will know if it gets out. They never feel more afraid than when their stable, intimate community gets ripped to shreds by an act that defies reason. And they wonder how well they really know each other. Dumb alibi alert: Nigel, if you’re making a statement to the police about your partner’s whereabouts on the night in question, make sure your mum’s on board. And was he covering up a crossbow in the van? Others who are watching this as it airs on BBC America have pointed out that because of the ads, some scenes may not make it to the broadcast due to time constraints, although the online episodes should be complete. The awesome production levels on this show continue to impress: This week I was noticing a lot of camera angles that simulated someone spying, or peering from around a corner. The Latimers are overwhelmed by an outpouring of gifts of flowers and food. Family liaison police officer Pete chimes in, “I’ll take some! Some amazing pies!” Wrong thing to say as usual, Pete! No surprise that Alec Hardy hates Broadchurch, and the first reasons he mentions, in his wonderful Scottish snarl, are “The air! The saaaaand!” And of course, the cursedly friendly people. So why do I suspect he’s going to be a town resident by the end of the series?